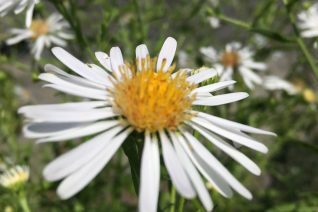 We selected this form of our locally native Douglas Aster for its snow white flowers. The species in our area ranges from blue/lavender/blue-white. So, this is a nice color break. One of the very best pollinator perennials that we grow. In bloom from July-October it is virtually swarmed by every flying insect you can imagine. A constant buzz of activity. This is a large, rambunctious perennial that is not good with delicate neighbors. Douglas Aster belongs in the wild where it can consort with other similarly overly adapted natives. Virtually any soil in full sun to light shade. In bloom it rises to nearly 30″ and the spread is nearly indefinite This is a rugged perennial for tough sites, even areas submerged during the wet season. Not a bad cut flower. Mix with large ornamental grasses such as Miscanthus sinensis ‘Morning Light’ or Panicum virgatum ‘ Heavy Metal’. Mix with native shrubs- Mahonia aquifolium, Oregon Grape and Holodiscus discolor ‘Ocean Spray’. Drought adapted when established but it appreciates a soak now and again to prolong the bloom period. Oregon native plant. 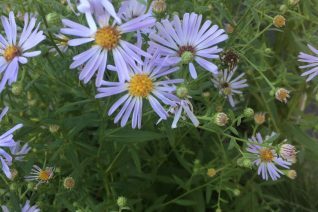 One of our color selections of the locally native Douglas Aster. This cultivar originates from seed collected on Sauvie Island. A boisterous long blooming perennial at home in wild areas. Rich to average soil with light summer water. Blooms- in this case, periwinkle blue open in early August and continue unabated to October. They are beacons to all pollinators and are constantly in motion as they bloom. To 32″ tall forming wide patches. Runs by underground stolons. Nice cut flower. Wetland remediation, forest verges, denuded road cuts. Those are jobs for you Douglas Aster. Oregon native plant.